getcalc.com's Mortgage Calculator is an online finance tool to calculate how much monthly repayment should be made for every month or period until the loan is completely paidoff for principal amount lent or borrowed at certain rate of interest for a particular period of time. What is monthly payment for 100000 mortgage over 5 years? What is monthly payment for 75000 mortgage over 15 years? What is monthly payment for 90000 mortgage over 25 years? What is monthly payment for 40000 mortgage over 5 years? 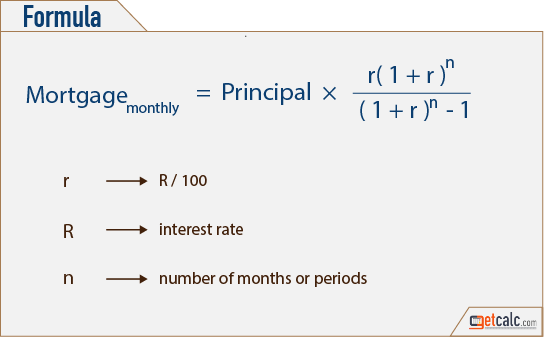 What is monthly payment for 1500000 mortgage over 20 years? What is monthly payment for 1000000 mortgage over 10 years?